Nearly 18 months after falling under a shower of bullets outside his parliamentary residence in Dodoma, Tundu Lissu, the most persistent thorn in the side of Tanzanian President John Magufuli, plans to return home and re-enter the political fray. An MP and chief whip for the opposition Chama Cha Demokrasia na Maendeleo (Chadema) party, Lissu intends to contest the presidential election in 2020. Though he walks with crutches and still has one bullet lodged near his spine, he told EURACTIV.com that he plans to return to Tanzania as soon as his Belgian doctors give him a clean bill of health, though they are “tight-lipped” about when this might be. After receiving emergency treatment in Dodoma, Lissu was quickly airlifted to a hospital in Kenyan capital Nairobi. He has been receiving surgery in Leuven for the past year and has one more round of surgery later this month. Lissu and foreign diplomats are convinced that the attempted hit was ordered by President Magufuli, whose security forces had already arrested him six times. But Lissu expects that the Magufuli regime’s next act will be to ensure that he has no constituency to return to. He says that the National Assembly Speaker will likely strip him of his parliamentary seat on the grounds that he has been absent since the assassination attempt, and failed to notify the Speaker that he would be out of Tanzania. “If they wanted to kill me, stripping me of my parliamentary seat is only a small step for them,” he said. Lissu is lobbying EU officials and European capitals to intensify their pressure on Magufuli, nicknamed ‘the bulldozer’ since his time as Roads minister, and his regime. Relations between the EU and Tanzania have rapidly deteriorated in recent months. The EU’s ambassador in Dar, Roeland van der Geer, was declared persona non grata and returned to Brussels the same month. “Magufuli has managed to completely destroy relations between the EU and Tanzania. The mood upstairs (in the Commission) is very ugly,” said an EU diplomat. The EU currently pumps in more than $100 million per year in aid and budget support to Tanzania, where losing foreign aid would increase an already widening current account deficit. The economy is suffering from a political crackdown on local businesses and foreign investors, which has prompted a capital flight to neighbouring Kenya and Dubai. “In September 2016, we came to visit our friends in Brussels and Berlin and we warned them that things were getting very bad,” says Lissu. The EU is now “finished with him (Magufuli),” said Lissu. The bloc is close to suspending all financial support for and political relations with the Tanzanian government under Article 96 of the EU-ACP Cotonou Agreement, a seldom used instrument which was most recently used with Burundi in 2016. He adds that individual member states are following the European Commission’s lead. Belgium is reviewing its relations and has withheld aid, as have Sweden and Denmark. However, neither the UK nor Germany have decided to freeze support. The crackdown by donors extends to the World Bank, which in December cancelled a $300 million education loan for girls’ education in response to a policy of expelling pregnant girls and not allowing them to resume their studies after giving birth. Meanwhile, a joint letter by senior members of the foreign relations committee in the United States Senate to Secretary of State Mike Pompei in December called on the Trump administration to halt financing for Tanzania. Lissu hopes that the international pressure on Magufuli, who was elected in 2015, will ramp up in the coming months and urged the EU and other foreign powers to act before it is too late. “There was some feeling that the 2020 election would be the litmus test and I put my feeling across that you don’t want to act after he rigs his way back into office,” he said. In his absence, the Magufuli government’s crackdown on opposition parties and civil society has continued. Amendments to a law on political parties will give the government sweeping powers to intervene in the nomination of candidates for local and national elections. The organisation of political meetings has already been banned. 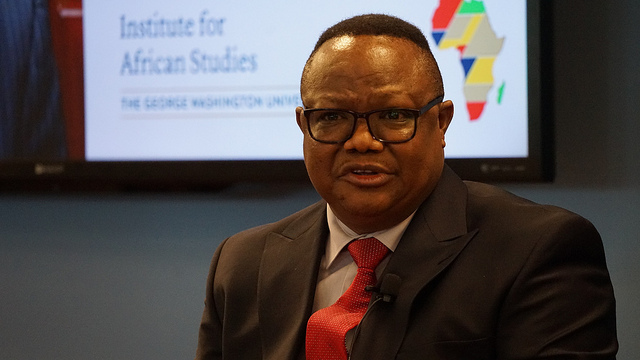 As his recovery continues, Lissu plans to step up the opposition’s diplomatic offensive, with a planned visit to State Department officials in Washington in the coming days. But will the EU really put its money where its mouth is? It has been largely silent following recent elections in Congo-Brazzaville, the Democratic Republic of Congo, Uganda, and Rwanda, which were marked by violent intimidation or the jailing of opposition leaders, and vote rigging. “I’m not naïve. I am not blind to the national interests of the individual member states,” said Lissu. It is hard to gauge how popular Magufuli actually is. The last surveys of public opinion were done by a company called Twaweza over a year ago. In 2016, Magufuli’s approval rating according to Towesa was in the high 80s but shrank to 55% by the end of 2017. The boss of Twaweza had since had his passport confiscated, while a law has made the independent gathering of statistics or disputing the accuracy of official statistics a criminal offence. But Lissu is confident that despite the legal crackdown on polling and political campaigning, there will be an election campaign worthy of the name.